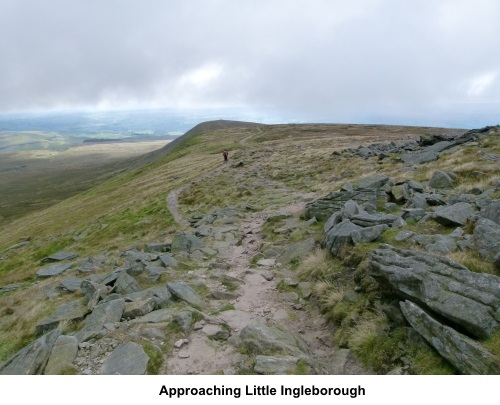 Introduction: This is probably the shortest and easiest ascent/descent of Ingleborough, certainly from Ingleton. Many people use this route to the summit then just return the same way but I prefer to make my walks circular. 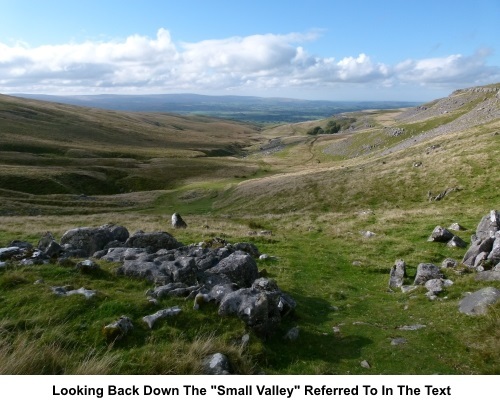 Having climbed the mountain itself, I decided to use return route over Ingleborough Common, for a change. There is a path marked on the OS map, though not the usual Right of Way green. However, this is Access and land so there is no problem with walking on it. Once you find the start of it, the route is obvious. There are other routes, not least my description from Clapham. 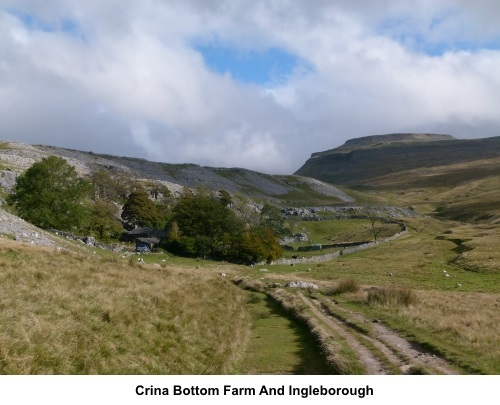 At 2372ft (723metres) Ingleborough is second only to Whernside as Yorkshire’s highest mountain and normally the first or last in the famous Yorkshire Three Peaks walk, depending on which way round it is tackled. The third peak is Pen-y-ghent. It was the site of an ancient hill fort, indicated on the OS maps and there is archaeological evidence of Iron Age huts, although nothing is visible, at least to my untrained eye. 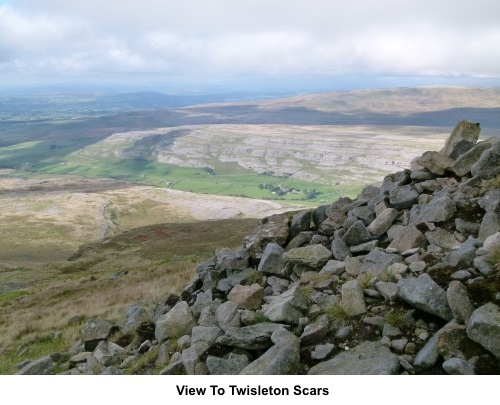 The views from Ingleborough are superb, stretching as far as the west coast and the Lake District. If you have the time, it is worth walking the short distance to the northern edge of the plateau for a fine view of the famous Ribblehead Viaduct on the Settle Carlisle railway line. One note of caution to bear in mind is that Ingleborough frequently has a cap of cloud. 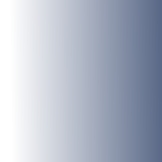 This can appear without warning on an initially clear day. 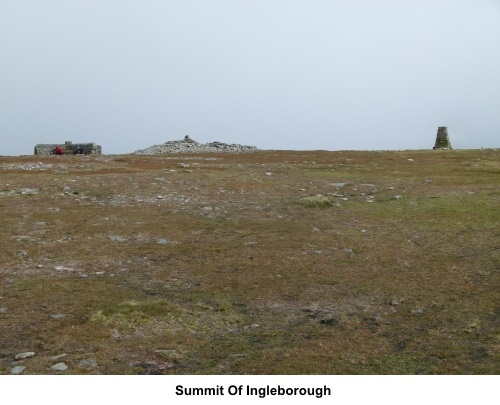 The top of Ingleborough is a strangely disorientating place in cloud/mist. The top is a stony plateau across which paths do not show up clearly. You are strongly urged to take a compass with you just in case. If the cloud does descend, there is a marked drop in temperature, so be prepared! There is some road walking on this route, not least around a mile and a half back to Ingleton but these are quiet lanes with little traffic. There is a very good cross shaped shelter on Ingleborough’s summit which affords protection whichever way the wind blows and is ideal for a picnic stop. 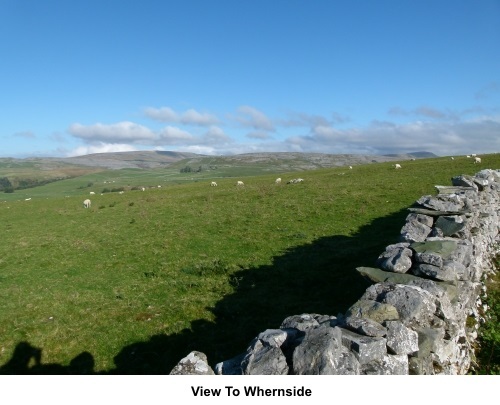 The walk starts from Ingleton’s car park by the tourist information office and library. 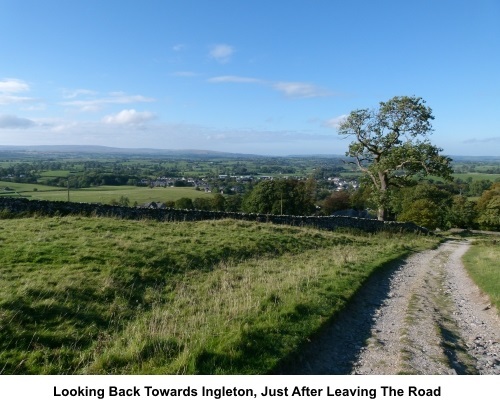 Ingleton is off the A65, between Settle and Kirkby Lonsdale. The car park is signposted. There are public toilets here. 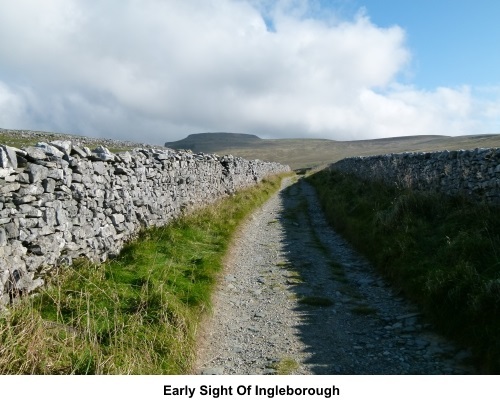 An alternative route up Ingleborough is Ingleborough from Clapham. Start: With your back to the Tourist Information/Library building (SD 695731), turn left and walk through the car park to the road. Turn left at the road (B6255) and follow it out of the village following the road sign for Hawes, passing the junction signposted for Clapham. This road to/from Clapham will be your return route. Shortly after the Clapham road, the B6255 bends left and almost immediately after that, outside Richmond House, turn right on to a broad track (Fell Lane Track) indicated by a fingerpost “Public Bridleway Ingleborough 2½ miles” (SD 702731). 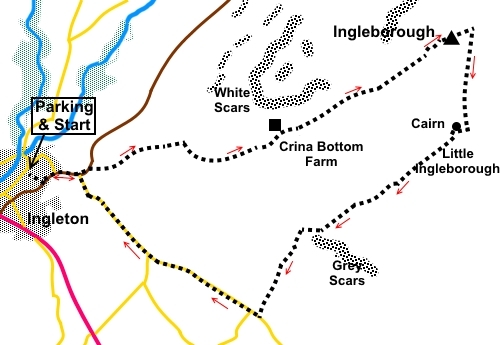 When the track forks (SD 722734), the left hand fork going to Crina Bottom Farm, stay on the right hand track, which has a finger post for “Ingleborough”. The track forks again at the top of a small valley. Again keep right on to the section “manicured” with stone chippings. The route then climbs some stone steps leading to a false summit. Once you reach this little plateau, ahead of you, at SD 739744 is an information board telling you about a stone tower built in 1830 as part of celebrations for a horserace. No trace remains as drunken locals pulled it down! After this board, climb some more steps, above which are three large cairns to guide you to yet more steps. There is then a fourth cairn and initially, the path beyond here is not easy to spot. It climbs above and to the right of that cairn. It does become clearer. After a short ascent, you come to the summit plateau with its cross shaped shelter and trig. point (SD 741746). The descent path is at the north eastern edge of the summit. If you stand with your back to the shelter, with the trig. point out to your right, follow the direction of the arm of the cross of the shelter to the plateau, where you will find the path running along its edge (SD 744746). Turn right along it. In good visibility, this is not a problem but if there is low cloud/mist, you are advised to use a compass and walk in a straight line between 80° and 100° magnetic. As long as you are somewhere within this arc, you should find the path. However do not underestimate Ingleborough’s ability to confuse in these conditions. 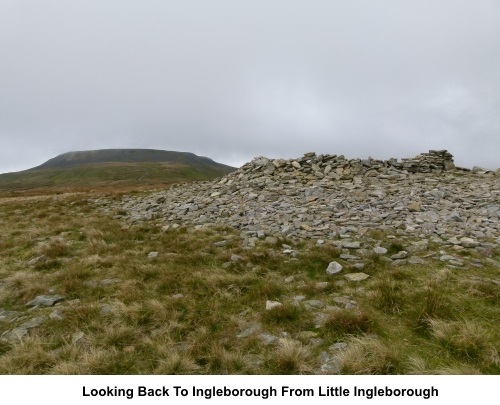 Follow the path along the summit edge, passing a large cairn as it begins to descend towards Little Ingleborough. The descending path from Little Ingleborough is not easy to find at first. On the top of Little Ingleborough is a rough stone shelter (SD 743735). Little more than a circle of stones. 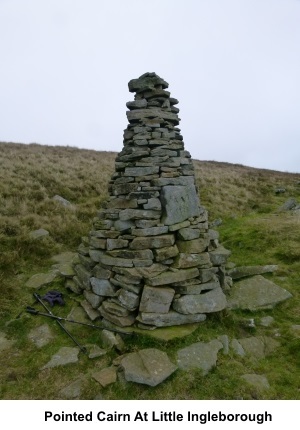 Walk round this in a widening arc and look out for the slim, pointed cairn shown in the photo SD 742735. This marks the start of the descending path which from there is easy to follow. 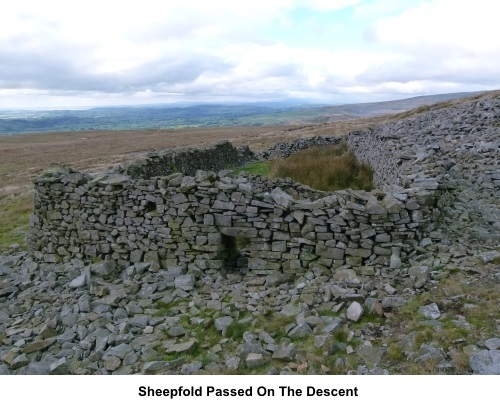 On the descent, you pass a sheepfold (SD 733728). You reach the road at SD 720715. Here, the exit from the Access Land was barred by a padlocked gate and there seemed no alternative exit. However, the gate unusually has a ladder arrangement built into it at one side which I took to be the exit route. Turn right at the road and follow it back to Ingleton.